IEA and OPEC are both out with their initial numbers for September global liquid fuel production (the EIA is currently up to July). I have updated my graphs accordingly. As you can see above, we are still in the "sideways stagnation" period that we've been in since February - almost within striking distance of the global record production in summer of 2008, but no longer heading upward more-or-less steadily as we were through most of 2009. 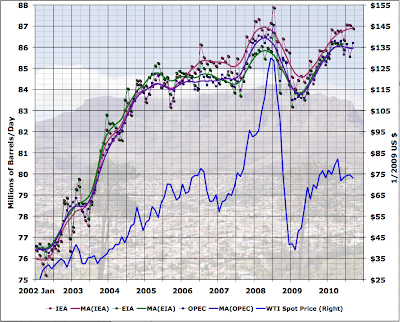 Note that the price curve stops in August (see here). So have we passed peak oil on a monthly liquid fuel basis? Who knows - anyone who claims they know is blowing smoke in my opinion (though of course some faction of the smoke-blowers might get lucky). A revival of the financial crisis (latest alarms here) would send demand plunging again, then posit more chaos in Iraq so that the al-Shahristani plan never comes to pass. Then we could very well have passed the highpoint of oil production (by the time demand recovered again, there could be enough additional depletion that the previous high couldn't be achieved). Then again, reverse those assumptions - even just a few good months could be enough - and we could exceed the 2008 peak quite easily. 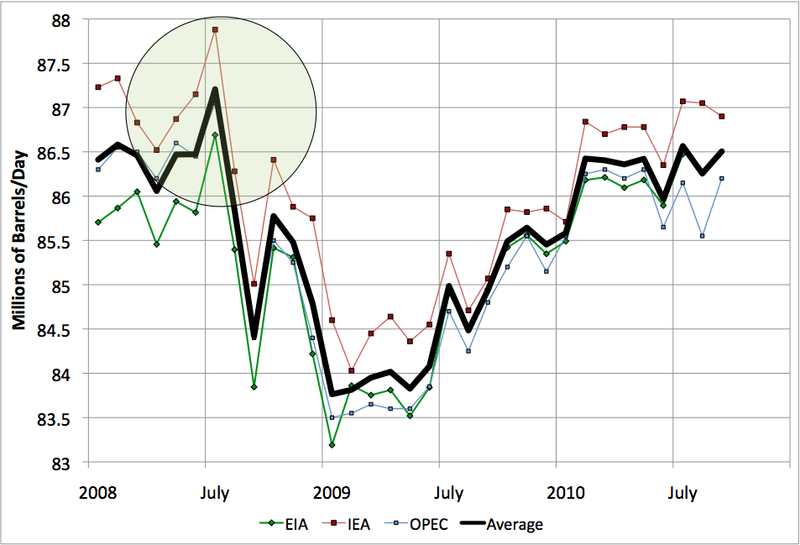 The IEA publishes the monthly Oil Market Report. They make a very brief free summary available on publication day, and the entire thing available after two weeks. I take the data either from the summary for the most recent datum, or Table 3. 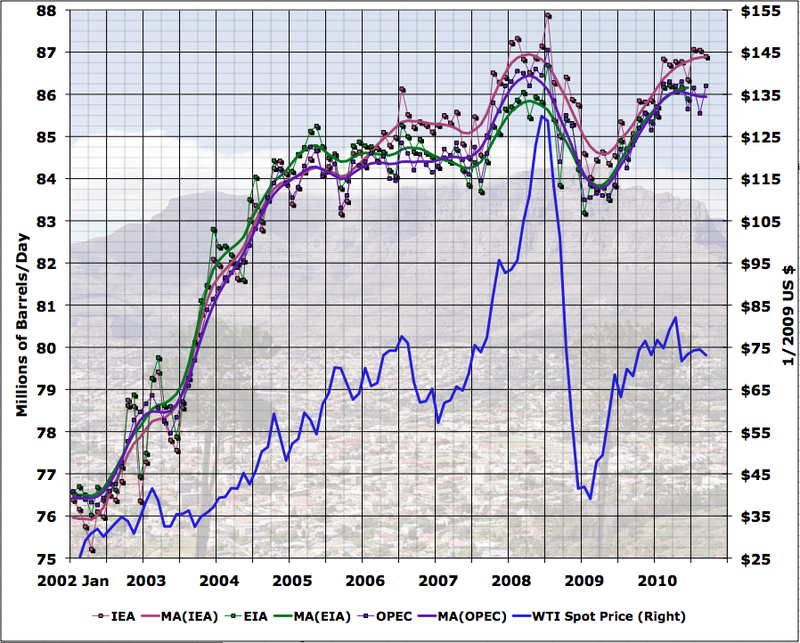 EIA price data are the West Texas Spot Prices from here. I inflation correct (currently to Jan 2009 $), using the BLS CPI index here. Calculated Risk has regular updates on traffic at the Port of Long Beach, archived under the tag Trade Deficit. Here's a graph I made correlating the TEU traffic with California distillate consumption. Waddya know, they're the same thing. Don't think I've posted this here in the past. Dunno if you have a leading indicator for conditions worldwide here. CA distillate is something like .36% of global demand, if my maths are right; but throw in all that marine diesel and bunker fuel, shipping and manufacturing costs overseas, etc. Calc Risk also has occasional posts about the Ceridian-UCLA: Diesel Fuel index, tracking diesel purchases nationwide. Also, Leanan links in today's DB to Iraq to Add 300,000 Barrels a Day of Capacity in 2011, Shahrastani Says. They were planning to be up 200 kb/d this year, but are actually down YOY. Also Iraq oil ambitions not viable, according to Sadad al Husseini. Thanks for the links KLR - interesting stuff.